What is Temporary Tables? - Temporary tables are used most often to provide workspace for the intermediate results when processing data within a batch or procedure. They are also used to pass a table from a table-valued function, to pass table-based data between stored procedures or, more recently in the form of Table-valued parameters, to send whole read-only tables from applications to SQL Server routines, or pass read-only temporary tables as parameters. Once finished with their use, they are discarded automatically. Temporary Tables are a great feature that lets you store and process intermediate results by using the same selection, update, and join capabilities that you can use with typical SQL Server tables. The temporary tables could be very useful in some cases to keep temporary data. Local temporary tables are the tables stored in tempdb. Local temporary tables are temporary tables that are available only to the session that created them. These tables are automatically destroyed at the termination of the procedure or session. They are specified with the prefix #, for example #table_name and these temp tables can be created with the same name in multiple windows. What is Local Temp Table? - Local temp tables are only available to the current connection for the user; and they are automatically deleted when the user disconnects from instances. Local temporary table name is stared with hash ("#") sign. What is Global Temp Table? - Global Temporary tables name starts with a double hash ("##"). Once this table has been created by a connection, like a permanent table it is then available to any user by any connection. It can only be deleted once all connections have been closed. 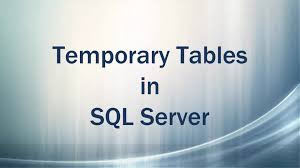 Note:Global temporary tables are visible to all SQL Server connections while Local temporary tables are visible to only current SQL Server connection.